I have had a terrible experience with my “smile-makeover.” It turned out horrible, so the dentist just refunded my money, and I am looking for a new dentist. I found your website while I was still his patient and was able to figure out that he had little to no knowledge of what you describe as a true cosmetic dentist. My teeth and gums are pristine according to a general dentist I went to for opinion and a periodontist I also went to for opinion earlier. I don’t understand why I need all of this, and I can’t begin to afford this and want your opinion. There’s a great variation in what some expert cosmetic dentists charge, and the fees you’ve been quoted are definitely on the high side, even if you actually need all the work that has been quoted. I would keep going down the list and get another opinion. Meanwhile, let me give you a little insight into what I think is going on in your case. You said that you know your bite is off, and it appears that you’re being quoted a fee for a full-mouth reconstruction to rebuild your bite. Do you actually need that? I don’t know that, but I can tell you that some dentists are very fussy perfectionists and they insist that every patient accept what they call “ideal treatment.” Other dentists are more pragmatic and will consider other options for patients who can’t afford the ideal. Fortunately, you’re in the Dallas-Fort Worth area where we have several recommended cosmetic dentists. Go ahead and shop around for second opinions. I want to tell you a story about this cost issue and dentists’ fee levels. There is a city where we have two recommended cosmetic dentists—let’s call them Dr. Smith and Dr. Jones. Dr. Smith is famous and has patients flying in from far and wide to see him. He does absolutely exquisite work. Dr. Jones also does very beautiful work and has won awards for the beauty of his work. Dr. Smith’s fees are about triple of what Dr. Jones charges. Is Dr. Jones an inferior dentist? I don’t think so because, guess what, Dr. Smith goes to Dr. Jones for his dental work. So get another opinion or two. I had full mouth smile makeover done (veneer crowns) in January 2017, 12 upper teeth and 10 lower teeth. After they put permanent crowns on, I felt sharp pain on teeth #5 and #13 (upper second premolars). The dentist did crown height adjustment 3-5 times, finally the pain went away, but tooth abscesses formed on top of both #5 and #13 teeth within 4-6 weeks. The dentist x-rayed and said the teeth nerves had died, and I need root canals. I was upset and didn’t realize that nerve damage could be a risk involved in veneer crowns. I remembered I asked if there is any risk doing smile makeover during consultation, I was told there is no risk. The X-ray showed that my teeth nerve are fine before the procedure. I am confused and don’t understand what is going on. The dentist said he didn’t know why, it rarely happened, I am the unlucky one. He referred me to an endodontist to perform the root canal procedure, and the endodontist found more teeth showing no response to cold test, also my gum flared up, swollen and very painful. So far I have had root canals done on 4 teeth (#4, #5, #13, #14), and #12 needs a root canal too, just matter of time. The tooth #3 starts feel strange too. Dr. did agree to pay half of the cost of the 4 root canals, but I am worried it will be an ongoing nightmare. What if the crowned teeth one by one goes bad over the time? I am very frustrated and feel misled. It not only financially cost me, but also add lots of stress on me. Please tell me what i should do and I need some advice. Thanks! To answer your question, I first need to lay down some terminology so we’re clear in what we’re talking about. I’m a big fan of clarity in communication, which requires precisely defining what words mean. You’re saying you had “veneer crowns.” But a porcelain veneer is one thing and a porcelain crown is something very different. A porcelain veneer requires very light shaving of the front surfaces of the teeth—sometimes no shaving at all is required. I found this photograph that illustrates a typical porcelain veneer preparation. Maybe half a millimeter of tooth structure has been shaved off, and the porcelain will be bonded over this. This second photograph shows a typical porcelain crown preparation for the same two front teeth. Much more tooth structure has been removed. It appears from your description that what you had done were porcelain crowns, not porcelain veneers. It is very rare that a porcelain veneer preparation on a tooth will end up making it need a root canal treatment. But a crown preparation will go much deeper into the tooth, increasing the risk of a pulp exposure, resulting in an infection of the pulp and the need for a root canal treatment. A smile makeover, by itself, does not require any aggressive grinding down of the teeth, which is what must have been done in your case. If your teeth had large fillings or decay before getting your makeover, then grinding them down was necessary. If that is the case, it wouldn’t be surprising if some of those teeth ended up needing root canal treatments. Anytime there is a lot of decay or large old fillings, there is a risk of teeth getting infected. But I would call that procedure a full-mouth reconstruction, not a smile makeover. But if this that you’re calling a smile makeover was just for aesthetic reasons, then your dentist was much more aggressive than he needed to be, and I believe he should be responsible for the cost of the damages he caused. If you weren’t told of any of these risks up front, he is especially vulnerable. A smile makeover should be done with porcelain veneers whenever possible, to avoid problems like you are having. There is even a trend in recent years for excellent cosmetic dentists to place what are called ultra-thin porcelain veneers, which require even less preparation than is shown in the photograph above. Some even try to do the makeover without preparing the teeth at all. But many dentists who aren’t expert in cosmetic dentistry simply don’t know how to do porcelain veneers very well, and so they resort to full coverage crowns. Porcelain veneers aren’t taught in dental schools—they’re a cosmetic procedure for which a dentist should get post-graduate education. As far as what you should do now, I don’t know what to tell you. You don’t really have any option, if you want to save these teeth, besides having the root canal treatments done. And it’s curious that your dentist is offering to pay half the cost of the root canal treatments. This seems to indicate that he is feeling some guilt over this. If that’s the case, I would press him to pay the whole thing. About what to expect long term, it’s hard for me to tell for sure from here. My guess would be that any teeth that end up having problems, you will find out within the first few months and then things will stabilize. I have taken great comfort in the information you provide and the honest, intelligent, accessible manner in which you provide it. I am 37 years old and had my entire lower arch redone with crowns and veneers over a year ago. My dentist is a cosmetic dentist listed on your website. She recommended a full smile makeover for my worn teeth. After years of clenching and grinding (I didn’t wear a nightguard until recent years), I was having a lot of sensitivity on my molars and my dentist said that I had a collapsed bite. I know that my dentist did a good job, but the whole process was very hard for me emotionally. I never wanted “perfect” teeth and I do miss some of the quirkiness of my originals. Even though I went for a “darker” shade (m2 instead of m1), I still feel they are a bit white for me. Also, I have had a bit of gum inflammation, which I never had before. My dentist is having me treat this with baking soda and peroxide and may eventually do some procedure she thinks will help. My dilemma is now that I am torn about doing the top teeth. My dentist is pushing for it. And indeed my top teeth are very worn, darker in color and contrast with the bottoms. However, my gums are very healthy on top and I have no pain at all in the teeth. I know that I cannot whiten the tips because I did Zoom whitening years ago and now I think my teeth are too worn and it may cause sensitivity. I am agonizing over this decision and would be very grateful for any advice you might have. My dentist seems to feel that my teeth will be better off if she completes the whole mouth, but I am so hesitant to go through such a big procedure when I not in pain anymore. The esthetic discrepancy does bother me a little, but maybe not enough to get this major work done. Thank you for any words you have for me!! It’s hard for me to give a definitive answer as to what you should do without seeing your case and knowing everything that is going on dentally. But I’ll see if I can be of some help with some guiding principles. There are points to be made in favor of both options–doing something and not doing anything. First, I am not in favor of half-mouth dental reconstructions. I don’t know what the crowns on your lower teeth are made of, but most ceramics are somewhat abrasive to natural teeth. Some of the newer ceramics are very kind to natural dentition, but most of them will wear natural dentition more than they would otherwise wear, which can lead to sensitivity and other problems. You may want to ask your dentist about this, if this is an issue in your case. The original problem was excessive wear of the teeth. I’m sure that wasn’t confined to the lower teeth–they both must have worn equally. And now your upper teeth are continuing to wear down. So it appears to me that your original problem is now half solved, and you need to finish the treatment. Having said that, crowning and veneering all the teeth is a very aggressive step, and if you aren’t completely sold on the benefits, my inclination would be to leave well enough alone. On the issue of the “quirkiness” of your natural teeth, a masterful smile makeover will include some “quirkiness.” If you discussed that with your dentist, I’m sure she could take care of that so that it wouldn’t be an issue. Knowing that is your preference, I think that most ceramists would love the opportunity to put some quirky features into your smile. My ceramist wanted to do that, but the barrier to doing that is that there are some obsessive patients who fuss over anything that they perceive as an imperfection in the smile makeover. I would want the smile to look natural–they would want all the teeth to be “perfect.” I would try to persuade them to have some imperfections in the teeth, but in the end the patients would get what they wanted. If the only problem you need to fix is the color, I would do whitening. You mentioned that you worry that you would have too much sensitivity, that you had Zoom whitening before and are reluctant to do that now. However, there are a number of other options for whitening the teeth besides Zoom. Zoom, because of the light, is more harsh than other options. Kör whitening is gentle yet very effective. There is also Nite White or Day White, Boost, Opalescence, and other systems, all of which are also more gentle than Zoom. 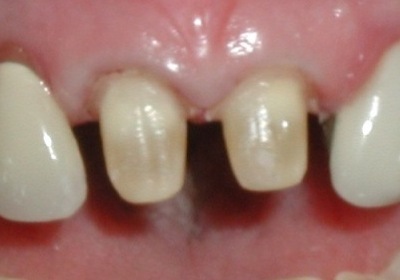 On the issue of gum inflammation around the lower teeth–I’m assuming that is around the crowns. That is a factor that should be taken into consideration. You could be having a sensitivity reaction to the ceramic in the crowns or it could be something else. I would try to pin that down before doing the uppers. 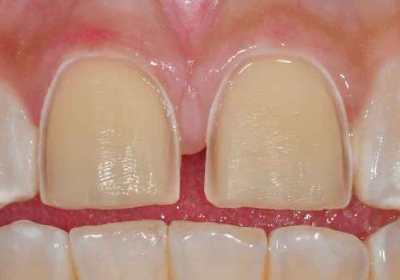 One excellent option could be doing porcelain onlays on the upper teeth rather than full crowns. Onlays stop short of the gumline so that gum inflammation shouldn’t be an issue. If not porcelain onlays, then porcelain crowns that only go very slightly into the gingival sulcus or even stop at the gingival margin. There should be a way to avoid this on the upper. And then, about the overall result. I had a number of patients who were hesitant about moving forward with smile makeovers and had some misgivings about the procedure before starting. But once it was done and they saw themselves in the mirror with their beautiful smile and felt that great sense of confidence to where they couldn’t stop smiling, I don’t believe anyone would have ever given a second’s consideration to going back to the way they were. It was always a positive, life-changing experience. You mention that the esthetics of your smile bothers you some now. I would fix that.